The Diary of a Nobody is the fictitious record of fifteen months in the life of Charles Pooter, his family, friends and small circle of acquaintances. It first appeared, serialised in Punch magazine and might be regarded as the first 'blog'; being a record of the simplicities and humiliations in the life of this mundane, but upright, city clerk, who had an incontestable faith that a record of his daily life was worth preserving for posterity. Set in about 1891 in Holloway, which was then a typical suburb of the impecuniously respectable kind, the authors contrive a record of the manners, customs and experiences of the late Victorian era. The bare record of facts, simply recorded, manages to be humorous rather than dull, no doubt because of the usual occupations of the authors. 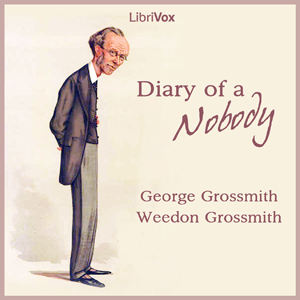 George Grossmith (1847-1912) was an actor and comedian. Weedon Grossmith (1852-1919) was an entertainer and illustrated the original work.